Posted by jeremyliew in advertising, targeting. Earlier this month the Lookery blog looked at the booms and busts of behavioral targeting. 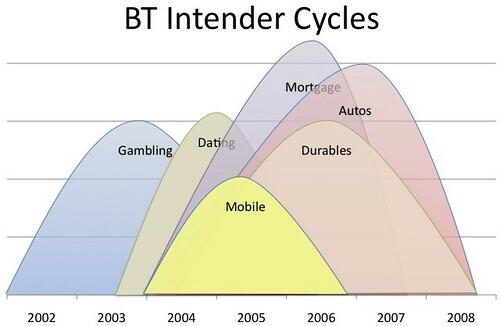 The economic cycle will turn eventually and bring back auto, mortgage and durables demand. Mobile and Online Dating may not return as strongly as they have been pressured by prices falling to marginal cost. I think online gaming will drive the next cycle. Let’s see. Posted by jeremyliew in advertising, standards, video. Media companies including Microsoft, Yahoo, CBS’s CBS Interactive and Hulu.com are joining forces to attract more money to the fledgling online-video advertising marketplace by testing ad formats. The project, dubbed “the Pool,” is the brainchild of Publicis Groupe’s Starcom MediaVest, which buys roughly $16 billion in U.S. ad time and space annually for big advertisers like Procter & Gamble. Starcom MediaVest and sister agency VivaKi say they are trying to create standards in the online-video market, which is popular with consumers but hasn’t turned into a serious money maker. The Pool, which includes six media companies and several marketers, such as Allstate, Capital One Financial and DineEquity’s Applebee’s, met in November, drew up a list of 30 online ad formats and whittled it down to five, which will be tested in focus groups this week. The two highest-scoring ad formats will be put into beta testing on the media companies’ sites. The Starcom MediaVest clients involved in the Pool have agreed to use the winning ad format and buy time on the media sites involved in the research. This is a very exciting development and likely will be a great catalyst to help boost the online video market. The IAB put out their online video standards in August and the Pool is further momentum towards the standards that will drive this market forward. It’s very good news. Next I hope we see a “pool” for social media, perhaps around engagement advertising? Posted by jeremyliew in HR, layoffs, management. It’s never easy to do a layoff. If you have to do it, Professor Bob Sutton from Stanford business schools gives good advice via Wired (oddly not on their website, but in their print edition). I’ve repeated the advice below with my annotations italicized. Predictability: (If it is clear that cuts will happen) Warn your staff exactly when cuts will happen. Secrecy breeds stress. Empowerment: Let them have some control over their exit. A package with options – say, a choice between extended health coverage or cash up front – reduces anxiety. Compassion: A little humanity goes a long way. This can include things like having surviving staff out of the office so that affected employees can pack up their desks without people watching them. What other advice do readers have? Posted by jeremyliew in digital goods, game design, game mechanics, virtual goods, virtual worlds. and later proposed a fourth use case, convenience. – Introduce items linked to specific events and communities (e.g. Christmas decorations and guild emblems). Posted by jeremyliew in 2009, start-up, startup, startups. Simplicity: Reduce the # of components necessary to generate revenue. Stability: Be consistently excellent at each of these components. Scale: Drive as much business as possible. Optimize for revenue generation over growth to preserve cash in a weak advertising market. Focus on what we can control and make sure, every day, that what we can control is more powerful than what we can’t. Set realistic deadlines and meet them. While I will continue to encourage and work with the team to set aggressive milestones for each of our weekly releases, we need to do a better job of making sure we always meet these deadlines, and don’t let them slip. Make sure everyone at flixster knows how much they matter. The further we get into this business, the more it is clear to me how directly responsible the talent and commitment of our team is not only for the successes we have had thus far, but for our hopes for the future and for the quality of the experience along the way. In a difficult economy especially, my 2009 new year’s resolution is to make sure everyone at Flixster knows that this is our company, to succeed or fail by our efforts and to be shaped along the way by our collective vision. Amy Jo Kim of casual game publisher Shufflebrain (Photograb) is letting users guide product development as much as the company’s own vision. My resolution is to listen to — and learn from — what the market is telling us, and mine the unexpected opportunities that are coming our way. In the new year, I resolve to get better at making data driven (characterize, hypothesize, predict, and test) decisions. This is an obvious point to most entrepreneurs these days, but the past year has really shown us that it isn’t as simple as just deciding to be data driven one day. Building the technology infrastructure and the engineering culture that makes this possible at scale are non-trivial projects. We’ve gotten a lot better at this in the short history of our company, but we’ve still got a long way to go, and we intend to continue to improve on this in 2009. Every Friday afternoon we will set aside time (away from our screens) to discuss all the things we achieved that week and list all we want to achieve in the following week. This will help keep everyone aware of what everyone else is doing, spark discussions and ideas that otherwise may not have happened, end the week with a better sense of achievement, and help us hit the ground running on Monday mornings. With such a small team we also need to better prioritize tasks. What are your new years resolutions for your company?